If you have multiple menus that already exist on your site, you can activate UberMenu on each of them (assuming the theme supports automatic integration). Just check each theme location you wish to activate. If you’d like to add a new menu to your theme, you can insert the PHP generated by UberMenu into your theme template. 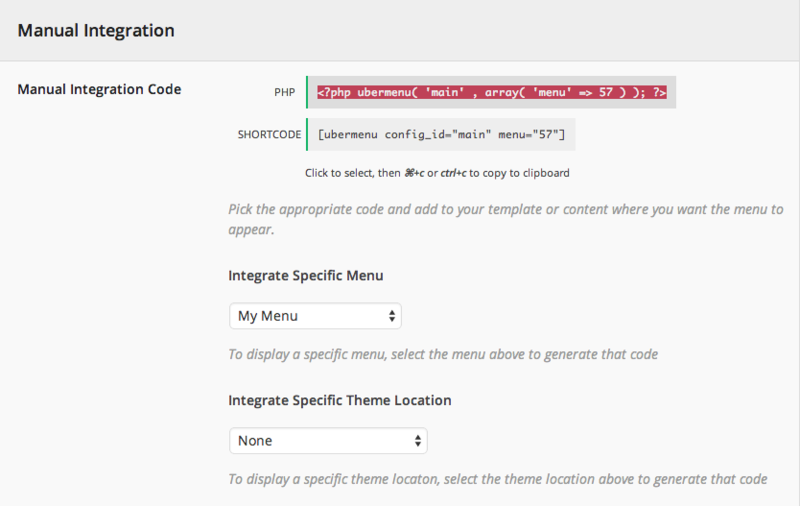 Choose a specific menu or a theme location to generate the appropriate code. Use the same Manual Integration method to generate a shortcode which can be placed in your site content. Drag the UberMenu Navigation widget into the appropriate widget area to add an UberMenu to your site. Set the Menu (optional) parameter to configure which menu to display.